Wow its really hard to believe that Christmas special dvds are already coming out in October but Nickelodeon is already ahead of the ball releasing winter and Christmas specials from your favorite Nick characters! The Backyardigans have their own Christmas special that includes five winter and Christmas themed episodes! The Action Elves Save ChristmasIt’s Christmas Eve and Santa’s Magic Sack is missing. This sounds like a job for Santa’s Action Elves! Tasha, Uniqua, and Pablo are the stealthiest elves around. Are they crafty enough to get past the Abominable Brothers? Pablo and the AcornsThe Acorns (Tasha, Tyrone, and Austin) are kindly Scouts who value outdoor adventure and helping those in need. But they are put to the ultimate challenge when they try to help Pablo, an evil dictator from outer space. The Big Dipper Diner Waitress Uniqua and Cook Pablo meet their hungriest customer yet when Hugs, a sweet little space alien, drops into their space diner. But an almost identical space alien, the Blarg, is also in the neighborhood shrinking things! The Amazing Splashinis The Amazing Splashinis (Uniqua, Tyrone, and Pablo) astound with their incredible synchronized dives. But practicing their latest dive becomes close to impossible when they discover a Sea Monster in the pool. We especially loved The Action Elves Save Christmas, which by the way only fueled Connor's already constant asking about when Christmas will be and when is Santa coming to see him again. heh. The Backyardigans must find Santa's missing magical Christmas sack! Without it Santa won't have any toys to deliver but the Abdominal Brothers make retrieving it a little tricky for the Backyardigan friends. I know I've said it before but I'll say it again, what we really really love about the Backyardigans is the fact that they introduce kids to types of music that otherwise they might not have experienced as well as foster creativity and imagination! 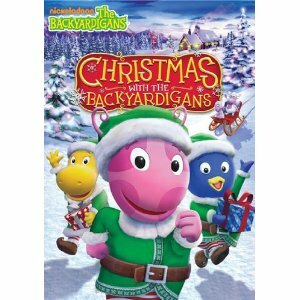 The Backyardigans : Christmas With the Backyardigans is available right now on DVD and you can pick up your copy on Amazon ! Disclosure: We were given a copy of The Backyardigans : Christmas With the Backyardigans free of charge, we were not compensated for this post in any other way. My opinions and comments on items we review are always my own and are never influenced by sponsors.